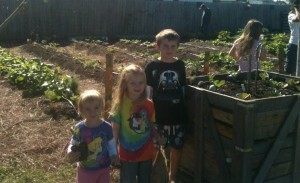 Last week we discovered our neighborhood garden. A friend made me aware of a community event that the garden was hosting. 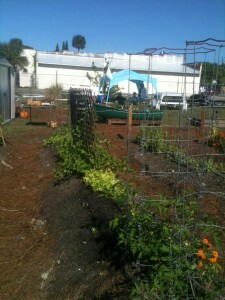 The community was invited to stop by, check out the garden, and learn what the garden is all about. I was super excited because I have been looking for a service project for the kids and I to get involved in. We arrived at the garden…. The garden is named Seeds for Change. It is a neighborhood garden dedicated to growing fresh produce to help feed those most in need in our community. Yes, this certainly seems to be the perfect community service project for the kids and I to become involved in! We were give a tour of the garden…. 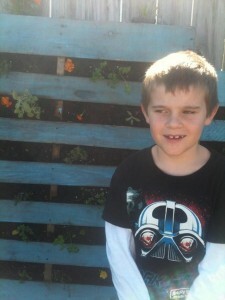 Alex is standing in front of a pallet planter. 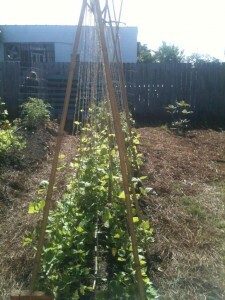 The garden donates these to people who do not have space to grow a large garden, such a great idea! This is the happy radish salad boat. I am now on the lookout for an old boat to recreate this at home! 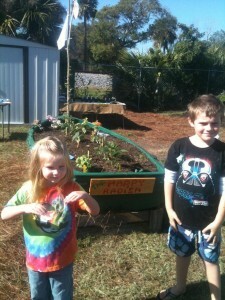 Children planted this boat, it is full of everything that you need for a salad. 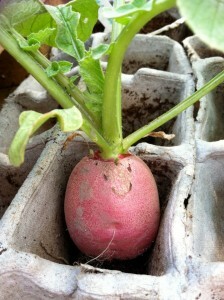 The name happy radish is named after the neighborhood gardens first radish. It was pulled from the garden with a happy face! 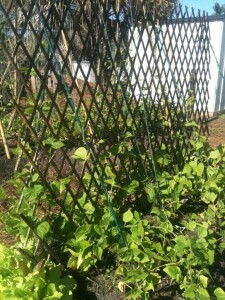 Through volunteering at our neighborhood garden we will be serving our community and also gaining gardening knowledge. 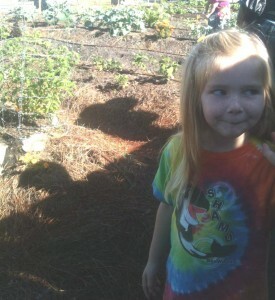 I want to mention that everything they grow at this garden is organic (yay!). As we were about to leave the kids were given the opportunity to pick a few plants to bring home with us. This was very kind and we were very appreciative. 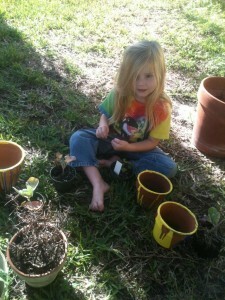 We took our plants home and Ava made a few more painted pots…. 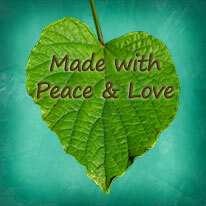 seedsforchangecorp@gmail.com or check out their Facebook page. I LOVE, LOVE, LOVE IT!!! I want to volunteer there too! 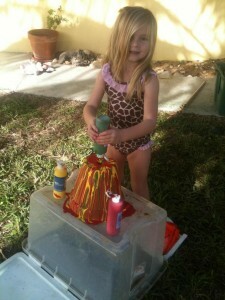 What an awesome project for you and the kids. YAY! i am so happy that you checked it out; the photos of the children are fabulous!! What a wonderful idea–and it does seem to be a great project to get your kids involved in. I just visited your blog for the first time….how did I not know? I am going to try some recipes…..hope you are well! Field Trip Friday: To The Beach!